You probably see it in your own neighborhood everyday: cheap vinyl siding that even the best installers can’t make look good. Or perhaps the homes around yours have rotted, moldy siding, bringing down the look - and property values - of the entire neighborhood. In the back of your mind, you know it spells one thing: homeowners who’ve gotten ripped off by fly-by-night siding companies. Now you’re looking to replace your own siding or add siding to your home. What should you do? Who can you trust? Here’s the secret to a good-looking siding job: There is no secret. A good-looking - and long-lasting - siding job can be obtained through a combination of research and old-fashioned common sense. Never Hire a Siding Contractor Who Just "Happens to Be in the Neighborhood"
You wouldn’t purchase a new car or a health insurance policy from someone who stopped by your house unannounced, so why should your investment in a siding job be any different? While some siding contractors who drop by your home and offer their services may be legitimate, many are not. They may try to retain a large deposit from you and then, presto, you never see them again. Or they may attempt to pressure you into signing an agreement before you’ve carefully read it. 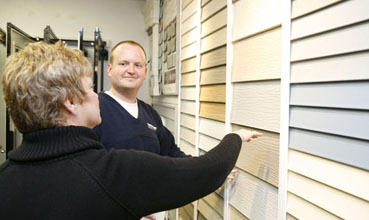 Before hiring any siding contractor, know who you’re dealing with and investigate the contractor’s firm carefully. Most of the top siding installation companies know to canvass neighborhoods where they are presently working as customers have the opportunity to monitor their neighbor’s job progress. Reliable companies generally don’t just "happen to be in your neighborhood." The easiest way to do this is to phone the Better Business Bureau (BBB) in your area and ask about the company’s reputation. Has the BBB received numerous complaints about the company? Has the company resolved the complaints in a timely manner? You can also access the website for the BBB in your region to find out this information. In addition, check online or contact your state’s Attorney General’s office to find out whether any class-action suits have been filed against the company. Above all, make sure the company has a legitimate, verifiable contractor’s license as well as a permanent business address and a land based telephone system as opposed to a pager or cell phone only. 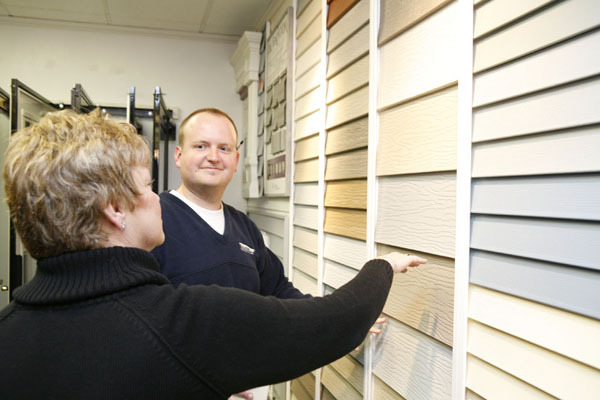 A siding company may have many satisfied customers, but all the products they use may not. In fact, some siding companies may continue to use faulty supplies even after a recall on these supplies has been issued. Since 1997, Louisiana-Pacific Corporation, headquartered in Nashville, Tennessee, has paid consumers several hundred million dollars in settlements as a result of the company manufacturing and selling their T-11 and other types of wood or composite siding that, over time, rots and grows black mold and mushrooms. Investigate all potential siding contractors and the products they use to make sure their materials are not faulty. Locate siding contractors that use products and supplies that have many satisfied clients. The field of siding has become so complex that it can be difficult to determine exactly which type of siding will suit your home the best. If you choose vinyl siding, make sure the siding has a solid core and form fitting insulation, which makes the siding look like real wood, rattle less than wood siding, and will increase your energy savings. These may include: the strength and thickness to provide impact resistance to hail, sleet, and wind; durability in extreme heat and cold; your choice of colors and options; proper insulation or underlayment; and shutters or accessories to bring the best out in your home. Don’t be afraid to ask the siding company to show you examples of its work or to provide you with verifiable testimonials from satisfied customers. The more legwork you do before the work is done, the more you’ll prevent unforeseen problems with your siding job. Please enter the number 59114 in the box provided below.